What is Custom Reporting in AgencyBloc? Using AgencyBloc’s Custom Reporting feature, you can create reports tailored to your specifications, share them and save them to run again and again. You can download them and analyze your data or share with others. The possibilities are endless for analyzing your data via reports if you’re thoroughly tracking your data and if you have access to a report builder. AgencyBloc’s Custom Reporting feature allow you to build reports with your data already in the agency management system (AMS). The image below briefly describes the process of building a custom report. Report Types are the categories that contain fields for setting up filters and columns in Custom Reporting. With Custom Reporting, you can share custom reports that you’ve created with others in your agency. This allows you to create a report once and then let everyone run the report whenever they need it. Only individuals who have reports permissions in your account will be able to view shared reports. When you share a report with others in your agency, they will only have access to report data based on their security group settings. Users in a security group are only able to see report data based on the areas they are granted visible permissions. 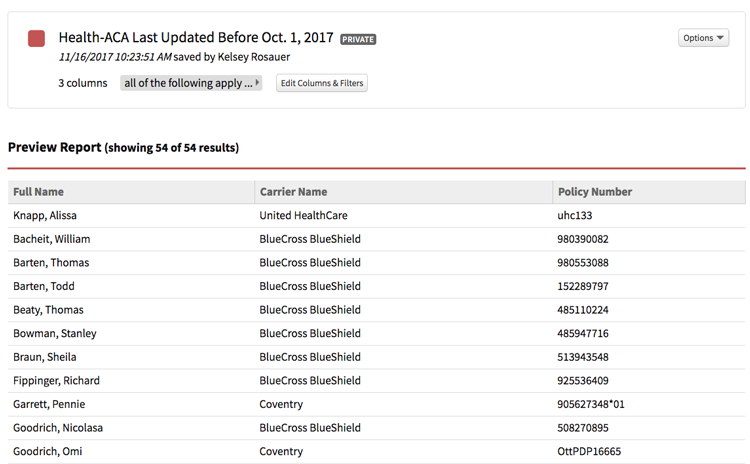 For example, if a security group is set with visible permissions for Groups, Individuals, and Policies but does not allow for visible permissions for Carriers, users in that security group will not be able to view any carrier data on a shared report. Also, users that don’t have access to view SSN or DOB data would not be able to see that data on shared reports. Once you have created a Custom Report you are able to view it again and again by clicking the Custom Reporting tab in the Reports section. You can preview and review your reports in-app or you can download them as Excel spreadsheets or in a CSV format.